There’s been a fair bit of debate in the media about poverty, unemployment and inequality in the last few weeks. Some commentators have claimed that inequality is not a serious problem and that unemployment is the bugbear and the boggart to be tackled. Others believe that inequality is a grievous threat to social stability and cannot be ignored. The debate is seemingly without end or resolution. The differing sides can’t agree on which social ill should be made a priority, nor can they find consensus on who is to blame for our record level of inequality and rate of unemployment. It might not be constructive to view the economy as a zero-sum game, but it’s not far off from one in the short-term, particularly with the very low rates of growth we’re experiencing. When this is coupled with the antagonism and tension between business, labour and government it’s not surprising that strikes have been protracted and nasty. 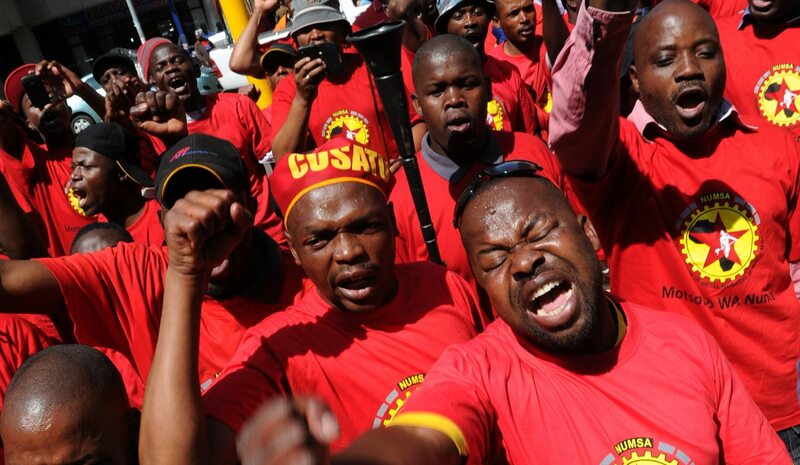 The recent strikes led by Numsa on behalf of petrol attendants and workers in the automotive sector have polarised South Africans. People either believe that the employers are greedy and selfish or that the employees are unreasonable and entitled. There is one group that is mostly overlooked in the analysis, and that is the unemployed. Usually the determination of wage increases is framed as a trade-off with unemployment. (The inverse relationship between the two is even formalised in economic theory, usually by reference to the Phillips curve.) The large wage increases in the platinum sector, for example, were at the expense of thousands of jobs. This discussion is also divisive: wage increases are supported by appeals to ‘decent work’ or a ‘living wage’ and they’re opposed by those who accuse organised labour of destroying jobs. Let’s shelve that debate for now. The recent strikes and wage settlements will affect more than just the jobs within the sectors themselves. They are going to make life harder for the unemployed, a group that is twice the size of all the unionised workers in the economy. Firstly, the wage increase for petrol pump attendants will be partly paid through an increase in the fuel levy. In other words, every South African citizen (and resident) that uses a car or catches a taxi will be subsidising the wages of the pump attendants, including the unemployed. Part of every social grant that is used to pay for transport to a job interview or a government clinic will end up in the pocket of a pump attendant. Secondly, the jobs in the automotive manufacturing sector are partly subsidised by the latest iteration of a motor industry support plan. It’s even more complicated than that even: auto producers are subsidised to produce cars, mostly for export markets. For every car exported, a producer earns credits that can be used to import another car for the domestic market. Higher wage settlements in this industry aren’t just underwritten by tax money (including VAT and fuel levies, paid by the unemployed) but also have a negative bearing on South Africa’s balance of payments. The trade-off is also seen in the above-inflation wage settlements for public sector unions. Every rand earmarked for members of Sadtu, Samwu, Nehawu, Popcru et al is another rand that cannot be earmarked for spending on social grants. The increases in social grants have been well below inflation and are forecast to grow by less than inflation over the medium-term. Union members receive above-inflation increases because they are members of lobby groups that are organised, concentrated and (often) militant in their demands. The unemployed, by contrast, are a diffuse group with no political power and no lobbying expertise. Over the last few years, the gap between the income of these two groups (the unemployed and organised labour) has widened. Supporters of organised labour will claim that their demands are morally justifiable and not excessive. They may also point out that the salary increases for top management are even higher. It’s hard to say, objectively, whether they’re right or wrong about the former claim, but it is accurate to say that the wage increases of public sector employees often come at the expense of other groups. Recent events have revealed that even some private-sector workers are being paid (in part) with public monies that could have been given to even poorer groups. Maybe the answer does lie in longer-term thinking and a social compact of some kind, with some restraints in remuneration at all levels. Such a compact appears to be dead in the water, given the low levels of trust between the various actors in the economy.